A deep bright red colour with well-balanced fruit aromas of raspberry, blackberry, cranberry and a hint of liquorice and violets on a spicy background. "Great with red sauce pastas at a super price. Fruits of raspberry, blackberry, on a spicy background. The wine is a nice blend of Grenache, Shiraz and Mourvedre." "It's lovely to smell good basic French wine, as nowadays I mainly smell and taste Australian wines. More feral is the best difference I can come up with and I like feral wine. This is very sound Villages wine and immensely enjoyable. It’s worth trying to taste the difference. For those that have been to France, it will remind them of eating at country restaurants. 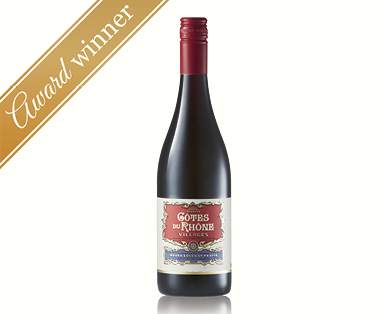 92 points and fantastic value at $9." "This appellation is a small step up from the basic Cotes wines, requiring a higher minimum alcohol level (riper grapes) and a lower maximum yield (better quality and intensity). Grenache is the predominant grape variety in this usually blended red, partnering mourvedre, shiraz and cinsault among others. A delightful easy-drinking medium-bodied red with a youthful deep colour, a fresh clean spicy brambly nose of raspberry and violets. The palate is medium bodied, with a characterful balance of savoury and dark berry flavours, fresh acidity and medium soft dry tannins. Ideal with lighter red meats and Mediterranean cuisines. In a word: moorish."